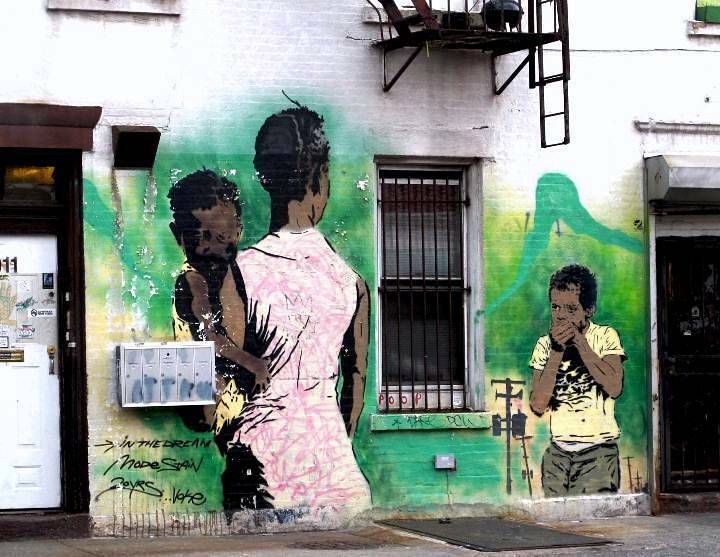 Queens-based artist Chris Stain is best known for his splendid stencil images that often reflect his concern with social inequality. We recently had a chance to speak to him following the opening of Sowing the Seeds of Love at Munch Gallery on Manhattan’s Lower East Side. When did you start getting up in public spaces? And where were you living at the time? In 1984. I was 11 years old and living in Baltimore. What motivated you to hit the streets? 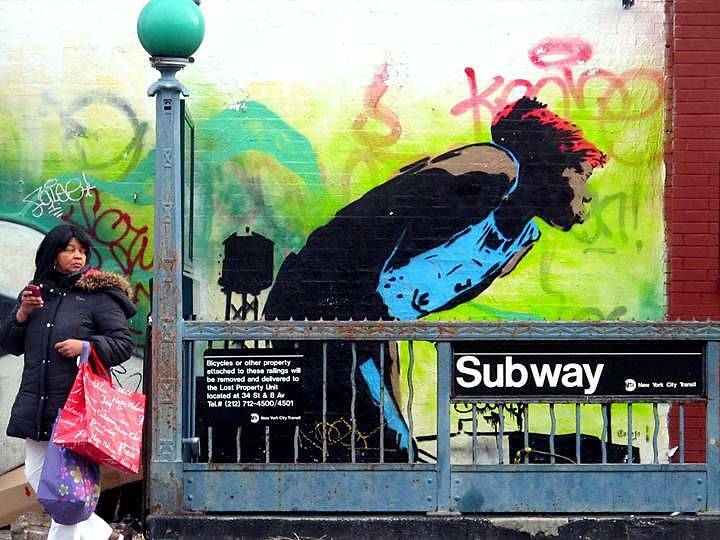 The movie Beat Street had a huge impact on me, as did the book Subway Art by Martha Cooper and Henry Chalfant. I also caught Style Wars on PBS. Were there any particular writers who inspired you back then? 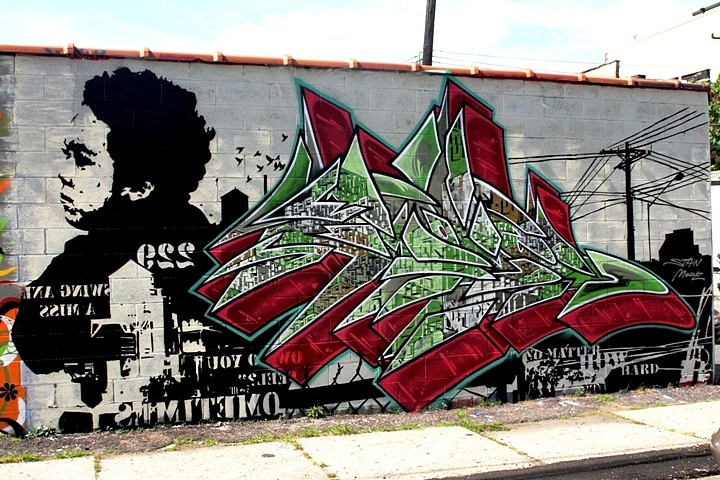 Most of us starting out in Baltimore were inspired by local writers, Zek, JamOne and RomeOne. Zek, considered the king at the time, was a lefty and had a distinct left-handed style that we all borrowed and tried to make our own. Another writer who influenced us all was Revolt who came down to Baltimore from NYC in the early 80’s. Have you a first graffiti memory? I was 11 when I did my first tag on the last house of a row of houses on my block. The kids on my block would usually find some flat black or white paint lying around somewhere in their fathers’ basement. But I used cherry red spray paint – the Testor spray paint that was bought for plastic car models — to put up my first tag. I wrote Savage. I wanted a name that sounded cool. Later I wrote Stain after hearing it rapped by Rammellzee in his song Beat Bop. 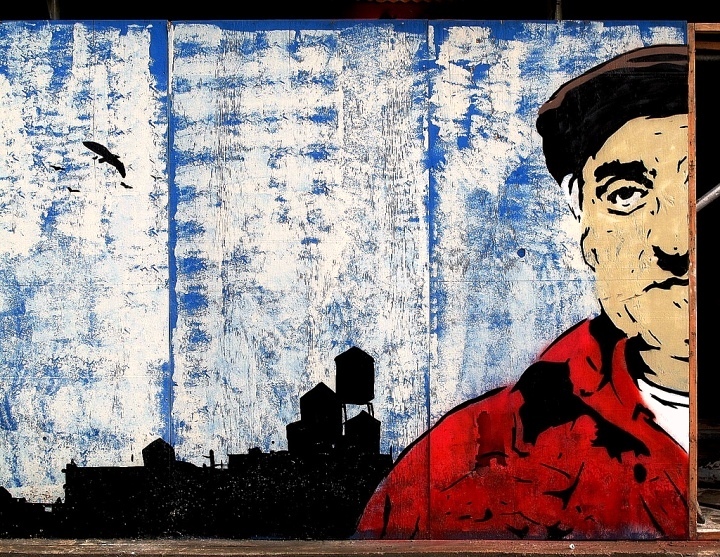 These days we identify you with huge stencils that surface on city streets. When did you first begin working with stencils? I began in the late 90’s. In the beginning of my artistic endeavors I was into traditional graffiti lettering. Long after I graduated high school, I began stenciling to tell more of a personal story. Three times…when I was eleven, sixteen and thirty-nine. I remember being grounded for two months after my first arrest. We’ve seen your work in a number of galleries here in NYC. Have you exhibited outside of the U.S.? My work has been exhibited in London, Paris, Amsterdam, Hong Kong, Germany, and Norway. 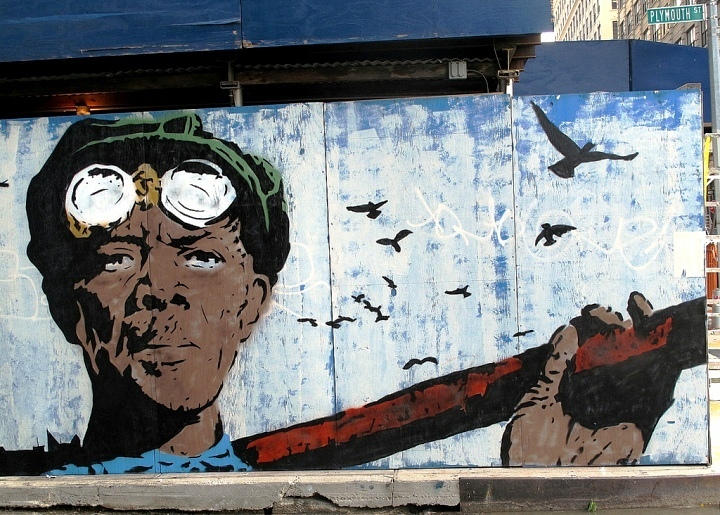 Have you any thoughts about the street-art graffiti divide? I don’t think about it. Both have their different energies. To me it’s all creativity. Among those with whom I’ve collaborated are: Josh MacPhee and the Justseeds crew , Billy Mode, Swoon, The Polaroid Kidd, Bill Daniels, Martha Cooper, Skewville, Login Hicks, C215, Armsrock, Know Hope, Nick Walker, Blek Le Rat, and Chris & Veng of Robots Will Kill, Hell Bent, and a host of others. I have mixed feelings. On one hand, it’s taken away from the specialness – the underground secrecy – of the counterculture. But it also allows us to easily share our work with one another. And that is a plus. No. I never attended art school. Not formally at least. I tried some continuing education classes to build a portfolio after I got out of high school but I had a hard time with the discipline. Your artwork reflects a strong social consciousness – both in your subject matter and placement. Could you tell us something about this? I was brought up to respect other people’s struggles. It is important that we treat others the way we would like to be treated – regardless of race, nationality or social status. If there is a message in my artwork, it is that we need to be more aware of each other. Teaching art, still painting with Billy Mode and working with JustSeeds. And I’d like to continue to show my work in galleries and create public works as well. That sounds great! We are looking forward to seeing your artwork anywhere!